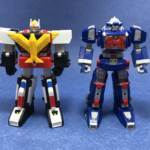 Super Minipla Announces Next Release- Chojin Sentai Jetman’s JET ICARUS! 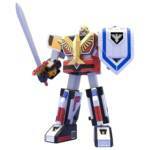 The next entry in the highly popular Super Sentai Minipla series has finally been confirmed! This time, the Minipla makers will actually take a few steps BACKWARDS in Sentai chronology- to 1991’s Chojin Sentai Jetman! The fan-favorite avian Sentai soars once again, with a release of the main Mecha Jet Icarus! At the moment it has not been stated if Jet Icarus will be the ONLY Jetman Minipla released, but based on previous entries in this series other Jetman Mecha seem very likely. Sadly, no price or release details have been revealed at time of writing. Stay tuned to TokuNation as we keep you up to date on all Super Minipla reveals! 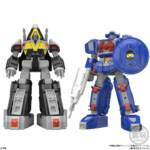 The much teased about Super Minipla Galaxy Mega and Delta Mega is finally getting ready for production and thanks to that: new stock photos for the pair have finally come out, giving us a good look at not only the two in space-ship mode but also the combined Super Galaxy Mega form. At the time of this writing, the release info for the two isn’t really clear. The pair were exhibited at the All Japan Model and Hobby Show which took place during the weekend. From there, the placard on display suggests that they will see release in January 2019 for 3,200 yen though whether this is for the two of them together or for them individually remains to be seen. In the meantime, you can stay tuned to Tokunation and we’ll be sure to update this article as more info becomes available. 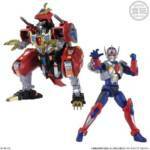 First Look at Super Minipla Dyna Dragon and Gridman Sigma Revealed? 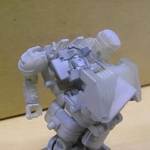 Super Minipla is showing no signs of slowing down! 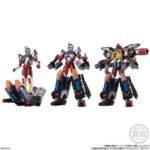 As you might recall, Super Minipla Gridman and God Zenon were both confirmed to be on the way just a few days ago. 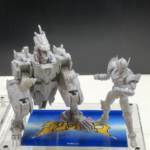 To top it all off, Bandai’s given us our first look at Super Minipla Dyna Dragon at Sumer Wonder Festival. The model is still in its early stages of development so it’s difficult to really say when this kit will come out or for how much. We can only assume that this bad boy will be able to combine with Gridman proper to create King Gridman. Upon further investigating, the Gridman shown next to Dyna Dragon appears to be Gridman Sigma, the lead protagonist from a Gridman show that never aired or made it into production until the 2015 short: Gridman Dawn of a new hero.